Georgetown University Press, 9781626164352, 238pp. It is beyond debate that human beings are the primary cause of climate change. Many think of climate change as primarily a scientific, economic, or political problem, and those perspectives inform Kevin O'Brien's analysis. But O'Brien argues that we should respond to climate change first and foremost as a case of systematic and structural violence. As he points out, global warming is primarily caused by the carbon emissions of the affluent, emissions that harm the poor first and worst. Climate change divides human beings from one another and from the earth; in short, global warming and climate change is violence. 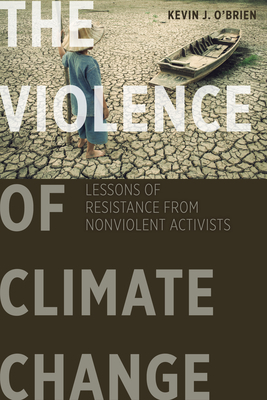 In order to sustain a constructive and creative response to this violence, he contends, society needs practical examples of activism and nonviolent peacemaking. O'Brien identifies five such examples from US history, providing brief biographies of heroic individuals whose idealism and social commitment and political savvy can model the fight against climate change and for climate justice: Quaker abolitionist John Woolman; social reformer Jane Addams; Catholic worker advocate Dorothy Day; civil rights leader Martin Luther King, Jr.; and union organizer Cesar Chavez. These moral exemplars, all of whom were motivated by their Christian faith, serve as witnesses to those seeking to make peace in response to the violence of climate change. Kevin J. O'Brien is dean of humanities and associate professor of Christian ethics at Pacific Lutheran University. He is the author of The Ethics of Biodiversity, coeditor of Grounding Religion, and coauthor of An Introduction to Christian Environmentalism. He holds a PhD from Emory University.